This beloved poem first appeared in the Knickerbocker Magazine (October, 1838) and was later included with other early works in Voices of the Night (1839). 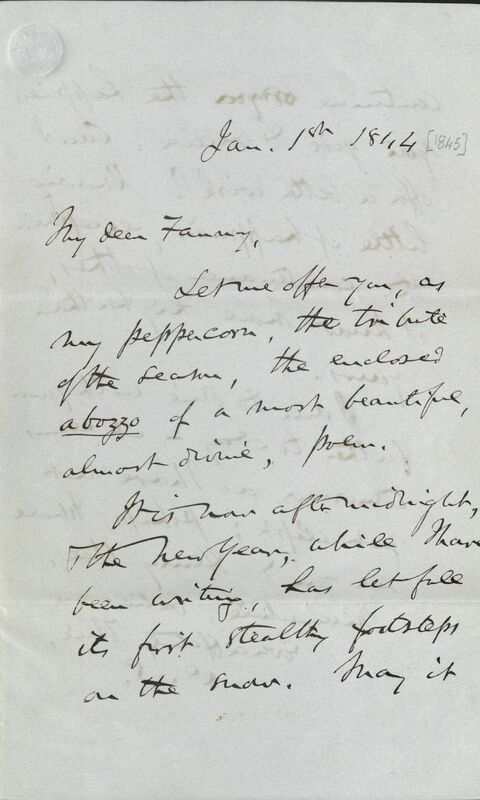 A rough draft came into the possession of Longfellow’s close friend, Massachusetts senator Charles Sumner, who returned it in a letter to the poet’s wife Fanny on New Year’s Day 1845, “which has let its first stealthy footsteps on the snow” – a clever play upon Longfellow’s footprint trope. 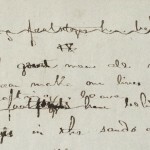 The draft, a fair copy of the well-known seventh stanza (acquired by the poet’s grandson, H. W. L. Dana), and Sumner’s letter were recently shown in a small Houghton Library exhibition, “Ruins of Unseasonable Time,” installed for the convocation of the North American Society for the Study of Romanticism conference, “Romantic Movements,” August 9th-11th 2013. 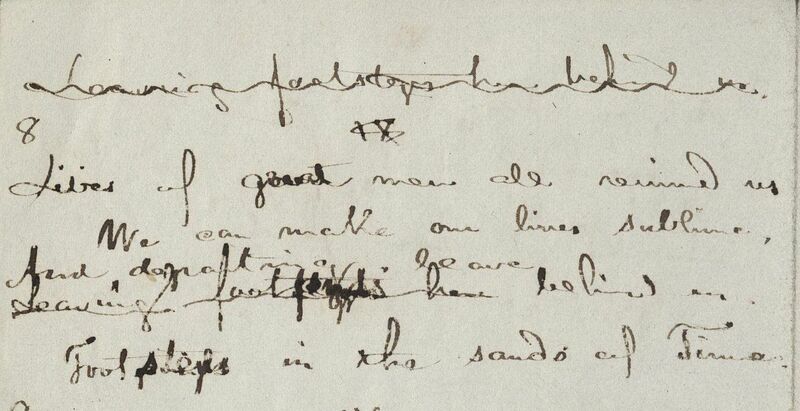 A small point, but one that might be of interest to those to whom accuracy about textual differences is importance: the document in question reads “Footsteps in” not “Footprints on.” (“Footsteps” is repeated in the line immediately following.) 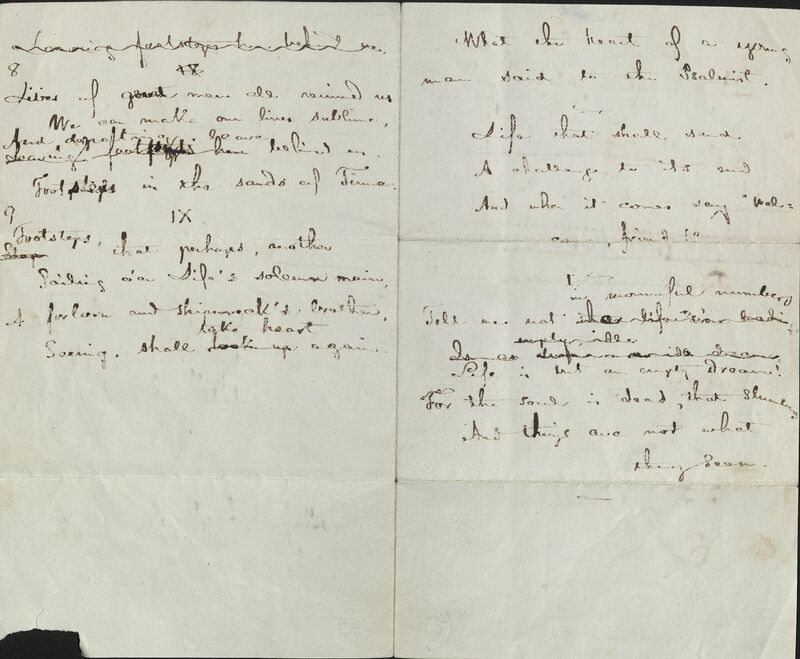 Aside from opening the door to inquiry about the “Footprints” emendation that appears in later drafts of the poem, this observation lends more point to Summer’s use of the word “footsteps” in his note to Fanny Longfellow.